As I have noted before, it is one of the great ironies of UK politics that recent growth only looks respectable because of immigration. Because mediamacro does not connect dots, politicians can get away with talking about a solid UK recovery, even though it is only half respectable because of the immigration they say must be reduced. But large migration flows are not just a UK experience. The focus on GDP rather than GDP/capita distorts international comparisons as well. I conducted a small twitter poll (something over 500 votes) asking which of these 4 countries had grown most rapidly from 2006 to 2015: Germany, Japan, UK and US. Now those who voted are by self-selection well informed about economics, but over half chose the wrong answer in a comparison where the winner is ahead by a mile. Here is a chart (using IMF data). I suspect the main reason why less than 50% chose Germany is that we are so used to GDP comparisons, and both the UK and the US experienced large scale immigration over this period. Using GDP the US wins (with 12% growth), closely followed by Germany (10.5%) and the UK (9.5%) with Japan way behind at 3.5%. But both the US and UK numbers are hugely flattered by immigration. Why did Germany do so well in terms of the average living standards of its people? We need to talk about demand and supply. As readers should know, Germany suffered from austerity just as the US and UK did. But as you should also know, this was compensated for by a large competitive advantage it had gained over its fellow Eurozone members because of slow wage growth from 2000 to 2006. Strong growth in net trade made up for austerity, leading to a comparatively strong output per head performance (and, going with that, a huge current account surplus). How was this demand boost met in terms of increased supply? Not through more rapid productivity growth (measured in terms of output per employed person), which hardly increased over this period. Instead it was through an amazing decrease in unemployment. In 2006 the unemployment rate in Germany was 10%, whereas by 2015 it was less than 5%. This in turn reflects the Hartz reforms, discussed by Tom Krebs and Martin Scheffel here. As they point out, this reform created losers (in terms of risk, particularly) as well as winners in terms of average income per head. All this emphasises the point that GDP figures can be a poor guide to growth in average incomes. It also puts into perspective claims by Conservative politicians, widely repeated by the media, that the UK has been doing better than everyone else. 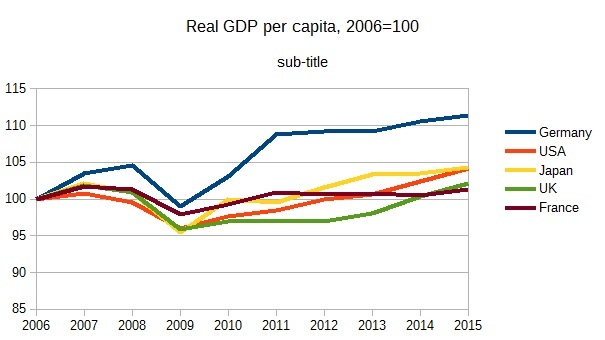 Over this reasonably long period (you can always cherry pick short horizons), Germany has clearly been doing better than anyone else among the major countries, with growth from 2006 to 2015 of over 11%. Next come a group of countries at around 4% growth, including the USA and Japan as well as Sweden and Switzerland. Below them is another group of around 2% growth, including the UK, Ireland and the Netherlands. Just behind at 1% is France and Belgium. Outside this established group, we have seen strong growth from Australia, Israel, and the Czech and Slovak republics, as well as some smaller countries. "Troika run Greece" is a bit insulting. "Greece, which is constrained by poor Troika choices" would be more appropriate. I've started to think, how compatible are statistical GDP measures across countries? Is there a danger different countries measure them differently, resulting in unreliable comparisons (similar to crime stats)? It is a while since I looked into this very briefly.The US used to make more use of hedonic price adjustments to take account of quality improvements than did other countries. This had the effect, with the year-on-year data, of showing lower inflation and faster growth than without the hedonic adjustment, flattering US performance relative to other countries on both measures. The effect varied from year to year. Things may be different now. I am unclear how that flowed through to per capita data (if at all). "It is worth commenting in passing that the shift in official statistics from GNP to GDP itself reflects a conception of economic decline. The former concept measures production by resources owned by citizens of the USA; the latter, production within the boundaries of the USA. The difference of course is foreign investment...when the USA began to import capital again in the 1980s, the use of GNP threatened to accentuate the sense of economic decline, to hasten the relative fall in American incomes. Switching to GDP moved Honda and Toyota production in the USA from Japanese GNP to American GDP." (Peter Temin, 'Measuring economic decline', in Understanding Decline (1997), p286). I have not read this book, so I don't know if the quote here is the whole of the relevant argument, and having been taught by by Peter Temin many years ago I am sure that he knows all about NI definitions and conventions. However the section quoted here is not correct (unless US NI data is very different from the UK). Switching from GNP "to GDP moved Honda and Toyota production in the USA from Japanese GNP to American GDP" is an over-statement. The switch did not move the whole of production in the USA, only that part of the production that was remitted in profits back to Japan. The part of value-added that was was due to US workers' wages was already included in US GNP. GDP up here. Down in Poland. Thank you. Interesting as always. On the contrast between Germany and Italy do you have any thoughts on the role of China? One hypothesis I have never been able to check out to my satisfaction is that because China competed with Italy in producing clothes and footwear but bought sophisticated high technology products from Germany, Italy suffered but Germany benefited from the rise of China. I wonder whether you think there might be significant truth in this and if so to what extent it qualifies the standard view that German reforms and Italian failure to reform account for the difference on performance? Would this explain relative resistance to populist rhetoric in Germany compared to other, more-lagging nations? Hasn't Germany also seen a lot of net immigration in the last 10 years? The UK's population has grown faster than Germany's, but I'd expect this is mostly because of the large difference in natural increase (+0.3% in UK, -0.3% in Germany). So it's true that Germany has recovered far better than some of the other countries listed, but this recovery could be even more dependent on immigration than the British/American 'recovery' has been. "Hasn't Germany also seen a lot of net immigration in the last 10 years?" The net immigration was lower than mortality surplus until 2011/12, therefore, the gain in employment between 2006 and 2011 was an absolute and let to a sharp decrease of unemployment. Since 2012 the has become less clear: The immigration is now much larger than the mortality surplus. Around 50% of the new jobs are in the low wage sector. ""Germany has clearly been doing better than anyone else among the major countries, with growth from 2006 to 2015 of over 11%""
Germany has clearly been doing better from 2009 to 2011. Would a time frame from the start of the crisis be a fairer starting point as Germany is getting an unrelated 'bonus' for structural reforms which are not related to how Governments have handled the years post crisis. Interesting and thought provoking, but the fact that you are trying to 'forgive' the SNP for inventing the term 'Project Fear' shows that you didn't follow the first independence referendum closely enough to know that it was NOT invented by the SNP. It was used by 'Better Together' in-house and leaked.